Maximum capacity no more than 4 anglers. A 50% deposit is required at the time of booking. We require 10 days advance notice to cancel or reschedule. Cancellation of less than 10 days will forfeit deposit. Cancellations by the Captain due to unsafe conditions may be rescheduled or subject to full refund. No Shows forfeit deposit. Guarantee that you will catch a lot of fish and have a great time! Note: dress appropriately. Layers are a great choice for fishing. It’s also a good idea to bring polarized sunglasses, a hat and sunscreen. 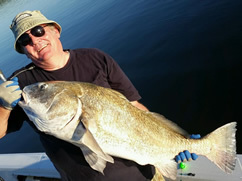 Book your Apalachicola Bay Fishing trip today!